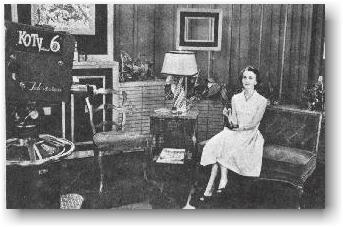 Nick Adams and Louise Bland, circa 1960 Louise Bland had her own daily talk show, "Spotlight", on KTUL and later produced a weekly show on KOTV. Stills from "Spotlight" may be seen at her web site, Art of Charm. 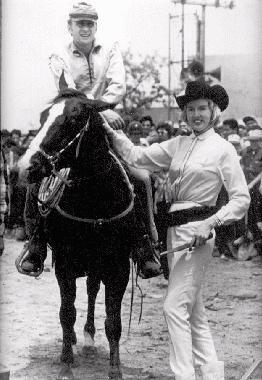 Louise co-hosted the "Treasure Hunt" on Channel 8's Lookout Mountain in the early 60s. Nick Adams of ABC's show, "The Rebel", was a special guest. "Channel 8 was owned by John Griffin of Griffin Grocery and Jimmy Leake, so the grocery put prize certificates in Griffin Coffee cans and buried hundreds of them all over Lookout Mountain...the people came in droves to seek their treasure." Louise met and interviewed many national celebrities on her show. Read about them and see them on the Louise Bland page. 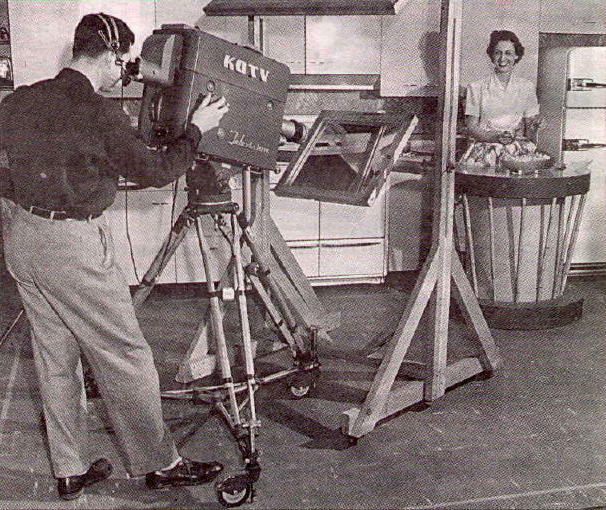 Betty Boyd (nee Carman) made her first live television appearance on KOTV, December 1, 1955. She is a familiar face and personality to a full generation of Tulsa TV viewers. 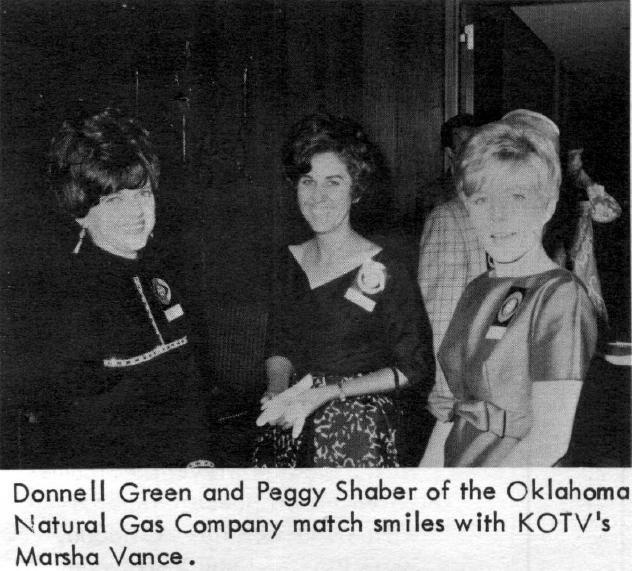 Some of the shows she hosted: "Woman's Page", "Hi Neighbor", "Boyd's Eye View", Plan For Action", "Oklahoma Sunrise", "AM Oklahoma" and "Good Morning Oklahoma". Much more on the Betty Boyd page. I also produced a cooking show for ONG in Oklahoma City. It ran for years; called "Foods 'N Focus" - the home economist for ONG was the personality. 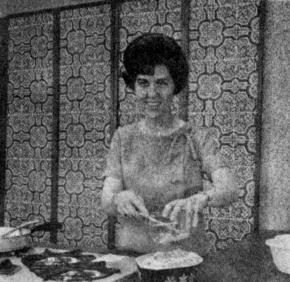 When I was a kid in the sixties my mom used to watch a cooking show. My mom would get a note pad, write down the recipes and try to cook it for supper. Mom has been deceased for years, funny the things you remember growing up. Buddy (Allison) was always first in line for the food off the ONG Coffee Break show, but was always the pro. We are installing gear here in DC in our Master Control room and airing now is "Cookin' Cheap" - a show done by Blue Ridge Public TV. One of the co-hosts - Laban Johnson - died last year so this is a re-run today with him on it. Buddy Allison would have chuckled at Laban's patter. 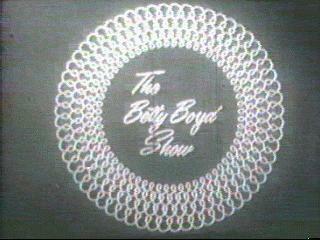 Watching this show so reminds of the Coffee Break show on 6 that aired at 10:55am for so many years. With Donnell Green for ONG. Also of the good times of working with Leon Meier and Buddy Allison. We had fun. You need to have fun in TV work. Can't ever see another small market cookin' show and not think of Buddy making wise-cracks on headset during all those shows I did at 6. Via Boing Boing, Jack LaLanne on the secret of happiness. In 1961, my mom ordered a LaLanne "Glamour Stretcher", a strong rubber cord with a loop on each end. Like most exercise gadgets, it worked IF you used it. Ours hung on the closet doorknob for decades. 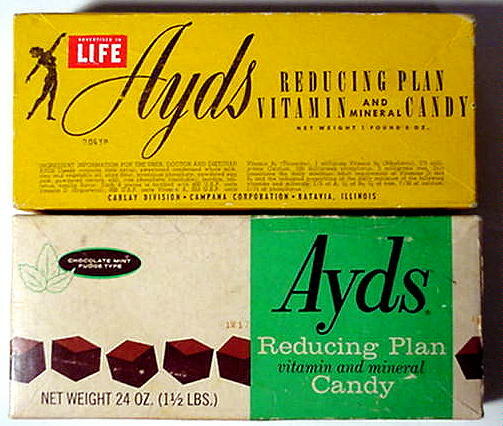 I imagine you can guess why the dietetic candy, "Ayds", isn't around any more. It certainly didn't taste that good. Debbie Drake was Jack's opposite number on TV. She undoubtedly got more than a few guys involved in exercise, at least of their extraocular muscles. Her leotard had a little collar, which made her lightly-clad visits to your living room seem a bit more formal. Debbie recorded an LP of tips for the ladies to keep hubby happy. Debbie Drake audio tracks can be heard periodically at The Swank Pad (recommended). The song, "Chicken Fat", recorded by Robert Preston in "Music Man"-style, was commissioned by President Kennedy for his Youth Fitness Program. We pupils of Mitchell Elementary School were given an option to purchase the single, which I duly exercised. "Chicken Fat" can now be yours for free in MP3 form. I can't remember any local exercise shows at the moment. I feel that I'm forgetting someone. Mock Coney Island Coneys from Scott Linder. Tulsa Public Schools Bean Chowder from Don Lundy. Let cheese soften and mix all ingredients together until smooth. The recipe should serve about 8 to 10 people. 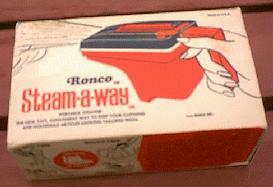 Ladies: Aim the Ronco Steam-A-Way at your blouses, skirts, pantsuits and culottes, and steam those wrinkles away!